It's been far too long since we've seen these Blue Bell ice cream treats in our freezer. After years of waiting, praying, and wishing on lucky stars, homemade vanilla ice cream sandwiches are finally back on store shelves where they belong. 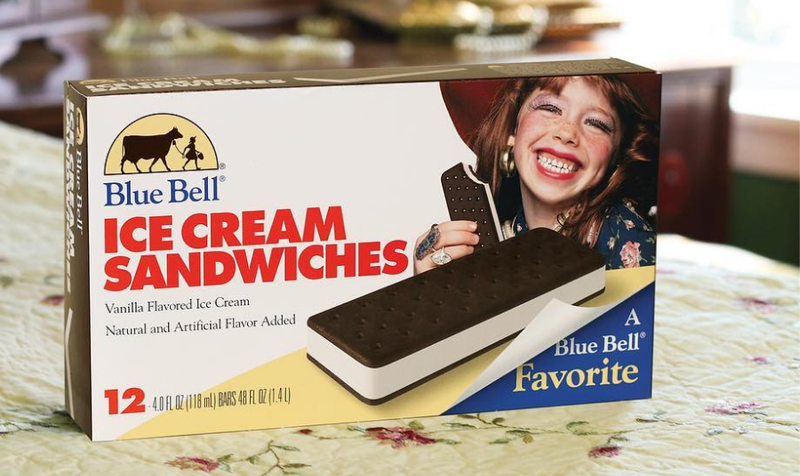 It hasn't been an easy road for these Blue Bell products. Most Texans can recall where they were and what they were doing when the Blue Bell Famine of 2015 struck. Ice cream lovers were getting sick due to listeria and an outbreak investigation was conducted by the Centers for Disease Control and Prevention. To prevent anyone else from getting sick Blue Bell Creameries halted all production of their ice cream, including all ice cream flavors and frozen snacks. There was no Great Divide to enjoy, no Krunch bars to feast on, and no Mooo bars to chomp on. Everything halted. That is until August 2015, four months later, when Blue Bell started producing ice cream again in small limited batches. Slowly the fan-favorites have been making their way back to the freezers. Today, the little creamery is constantly pushing out old and new favorites. After a long four years, Blue Bell is proud to be adding ice cream sandwiches back into the mix and we couldn't be happier. The twelve-pack features delicious homemade vanilla ice cream sandwiched between two chocolate wafers. You can either eat them as is or better yet, incorporate them into an ice cream cake recipe. Simply place the ice cream sandwiches in a 13x9-inch pan and top with whipped topping, caramel sauce, chocolate sauce and any toppings that you wish. We are suckers for miniature m&m's and chopped up Reese's. Place in the freezer for an hour and serve by cutting into slices. Is there Blue Bell available in a store near you? Check out the store locator here.